When it comes to savory and salty, it’s hard to argue with the flavor of bacon. 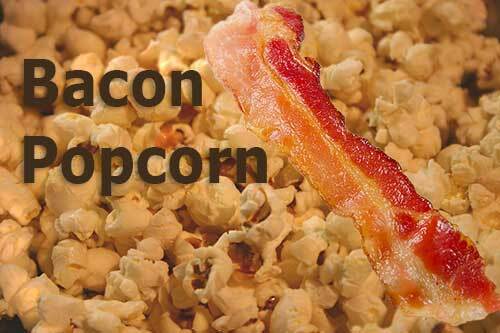 Bacon flavored popcorn isn’t really anything new, it’s just popcorn popped with bacon grease. This is something many people’s grandparents or great grandparents have been doing all along. There is a company called J&D’s that makes a pre-popped bacon flavored popcorn and a microwave version. We don’t think it actually contains bacon, and the microwave version received some pretty bad reviews. So we are going to stick with the real thing. First thing we will need is some bacon grease. Cook up some bacon and save the grease. Now it is time to make some popcorn. You can make this in your whirly-pop or, if you don’t want to get bacon grease in it, just use a pan with a lid and shake it back and forth over the stove-top. Pop your corn using a whirly-pop popcorn popper or on the stove top. To use the stove top just heat oil and test with a couple of popcorn kernels. After they pop, add the rest of the popcorn and cover, then move the pan back and forth until all or most kernels are popped. After the corn is popped, additional bacon grease or butter can be added (also optional), then add salt and stir in bacon bits and cheese if desired.